This book examines the role that the traditional understanding of science plays in how we understand the capitalistic system and how it informs business and business school education. Science serves many purposes in business organizations; it is much more than just a method to gain knowledge about business problems. It acculturates students to a certain way of thinking about the world and provides a rationale for the things business does and a justification for its purposes in society. It then utilizes the philosophy of Classical American Pragmatism to view science in a different manner, reconceptualizing the multiple environments in which business functions. 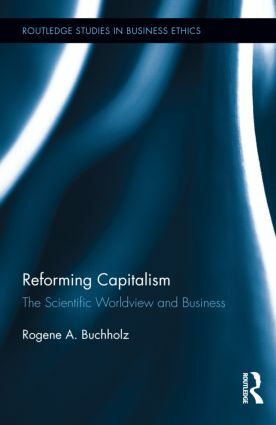 Author Rogene Buchholz traces the implications of this view for our understanding of the corporation, how science is used in business organizations, the recent financial crisis, and finally what it means for management and management education. No other book examines capitalism and the business system from this unique and timely perspective. Rogene A. Buchholz is the Legendre-Soule Chair in Business Ethics Emeritus in the College of Business Administration at Loyola University, New Orleans. He has published over seventy-five articles and is the author or co-author of twelve books in the areas of business and public policy, business ethics, and the environment. Business ethics is a site of contestation, both in theory and practice. For some it serves as a salve for the worst effects of capitalism, giving businesses the means self-regulate away from entrenched tendencies of malfeasance and exploitation. For others business ethics is a more personal matter, concerning the way that individuals can effectively wade through the moral quagmires that characterise so many dimensions of business life. Business ethics has also been conceived of as a fig leaf designed to allow business-as-usual to continue while covering over the less savoury practices so as to create an appearance of righteousness. Across these and other approaches, what remains critical is to ensure that the ethics of business is the subject of incisive questioning, critical research, and diverse theoretical development. It is through such scholarly inquiry that the increasingly powerful purview of corporations and business activity can be interrogated, understood and, ultimately, reformulated. This series contributes to that goal by publishing the latest research and thinking across the broad terrain that characterised business ethics. The series welcomes contributions in areas including: corporate social responsibility; critical approaches to business ethics; ethics and corporate governance; ethics and diversity; feminist ethics; globalization and business ethics; philosophical traditions of business ethics; postcolonialism and the ethics of business; production and supply chain ethics; resistance, political activism and ethics; sustainability, environmentalism and climate change; the ethics of corporate misconduct; the politics of business ethics; and worker’s rights.